Crete is the largest and most southern of the Greek Islands, but often the most overlooked. This breathtaking island is a destination all on its own and offers a unique twist on the history and culture of the region! An itinerary to Crete can be completely personalized to you because of the diverse landscapes offered there. You will find mountains, vineyards, beaches, and everything in between. Crete has two international airports, making it extremely easy to get to from other cities around Europe. Within Greece, we often recommend taking a ferry to the different islands. Bit, of course, every traveler will have a different “ideal” and no itinerary should follow any strict formula! Within Crete, we recommend starting your itinerary on the west side and working your way east. The west side of the island is much more active, while the east side is better for relaxing on a beach! Stay in Chania while in the west, the old city of Crete that boast many Venetian influences. We often recommend a few nights in Casa Delfino, located in the heart of town, or Domes Noruz for more of a resort option. While in Chania, hike through Samaria Gorge, Europe’s longest limestone gorge located in the UNESCO-designated White Mountains National Park. Once you are done with hiking, head east for some beach time. Make sure you stop at some of the vineyards along the way! Allow Ourisman Travel to book you a full day excursion on the east side of the island. You can enjoy a sailing day along the north-east coast. The itinerary could include visits to the village of Plaka and the island of Spinalonga. Spinalonga is known as the Leper Island, the island where lepers from all of Greece were quarantined to until 1957! You can experience the island and what life was like. 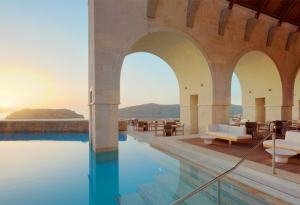 This entry was posted in Europe and tagged Beach vacation, Crete, Greece, Luxury Collection, Virtuoso, Virtuoso Week. Bookmark the permalink.